Larry Coleman is one step closer to the ABA National Championship with a first place win and $468.00 in the American Fishing Tour bass tournament held on Newton Lake this past weekend. 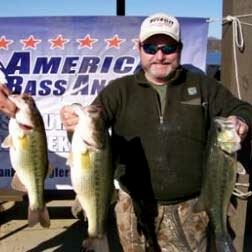 Coleman's three-bass limit weighed in at 13.31 pounds. The winning formula for Coleman proved to be a lizard and other creature baits. Mike Buchanan finished second with a two-fish weight of 6.55 pounds, while Dennis Carder took third with a huge fish that tipped the scales at 5.59 pounds. Carder's fish was also the BIG BASS of the tournament. Only Coleman caught a three-fish limit on the day as bass just weren't biting hard due to a cold front that moved in days before the tournament. Although the weather was beautiful for the anglers the fish were still transitioning and were caught at a variety of depths and lure presentations. These anglers are acquiring valuable points to determine divisional angler of the year and earn a berth in the American Fishing Tour National Championship that will be held this fall.